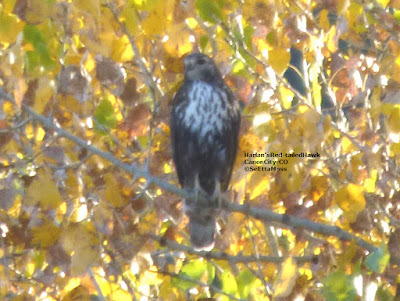 I found this Merlin last week but had computer problems so could not upload the photos. 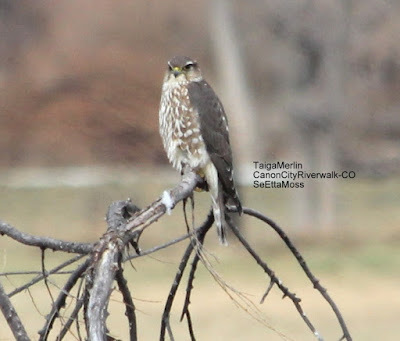 As Merlins are uncommon winter visitors in Canon City I believe it is the same Merlin as was seen by my friend Cathy near the Abbey the week before and likely the same as was seen by friend Linda on the Riverwalk before that. 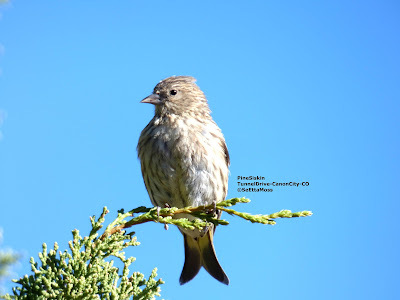 I first spotted it perched in large tree on the other side of the Arkansas River from the Canon City Riverwalk where I was walking--see bottom pic for that view. After watching it stretch and look around a lot for about 5 minutes it flew over to the river and harassed a pair of Mallard Ducks, in fact flushed them though it is way too small to be a real threat to them. 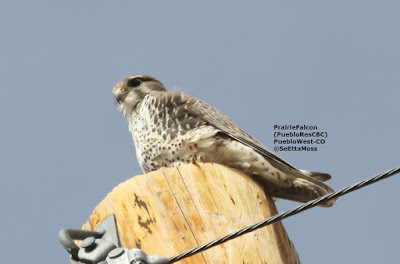 Yesterday I drove east of Pueblo looking for Harlan's Red-tailed Hawks and any other raptors I could find. 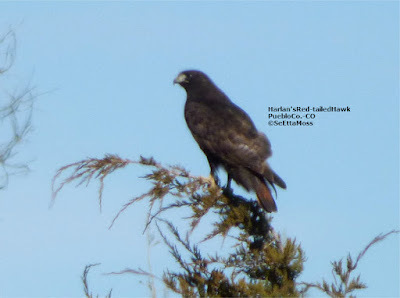 I was rewarded for my efforts with a total of 3 Harlan's, 1 Merlin and 1 Prairie Falcon in addition to 7 Western Red-tailed Hawks. 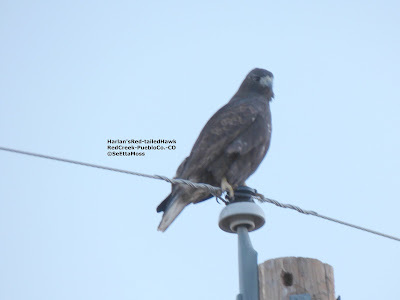 This is the first Harlan's I found which was in far eastern Pueblo County. 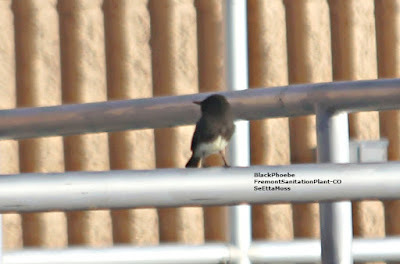 It was very, very skittish so the closest I could get for pics was 400-500 feet which put my extended zoom to it's max. And it only perched on trees on private property away from the public road. 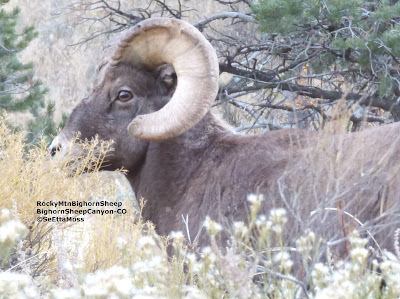 When I drove up Bighorn Sheep Canyon west of Canon City earlier this week I was looking for bighorn sheep as this is the time of year they begin their annual mating season. I didn't have to squint to see the big ram as he was right in the traffic lanes of H50. I drove slowly towards him in hopes he would leave the highway and he did. See bottom pic for view from inside my car of this ram and some of his harem. 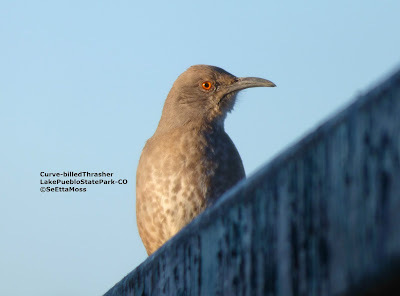 His harem was right grazing on the side of the highway and he joined them while keeping an eye on me. This ewe is wearing a monitoring collar--provides info to wildlife officers on where the bighorn sheep go during different seasons. 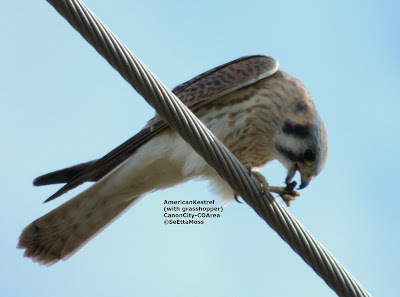 Caught this American Kestrel just as it was above to bite down on a grasshopper. This is one of a half dozen Cedar Waxwings I spotted yesterday feasting on juniper berries in Canon City. 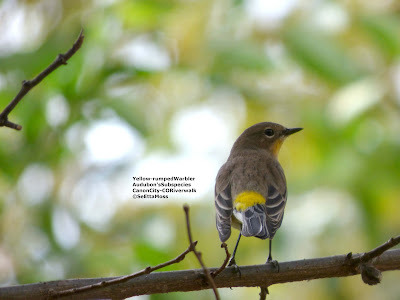 Yesterday I was delighted to find at least 10 Yellow-rumped Warblers foraging in a mixed flock on the Canon City Riverwalk with at least a half dozen Ruby-crowned Kinglets, several Black-capped and Mountain Chickadees, several Downy Woodpeckers, a couple of Am Robins, at least 2 Brown Creepers and one White-breasted Nuthatch. 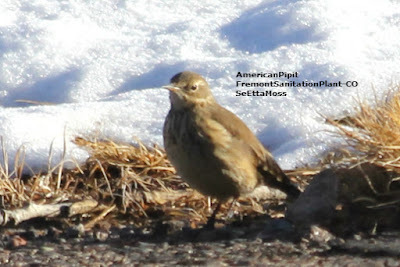 Since Yellow-rumped Warblers usually overwinter in the Canon City area it is not possible to know if these were migrators or some that will stick around. 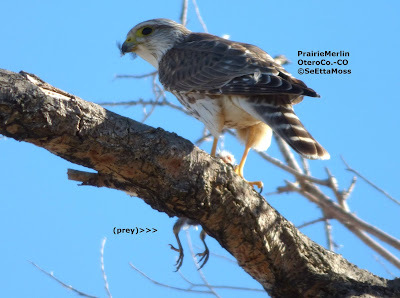 While they breed in and near Alaska, Harlan's Red-tailed Hawks winter in parts of eastern Colorado. 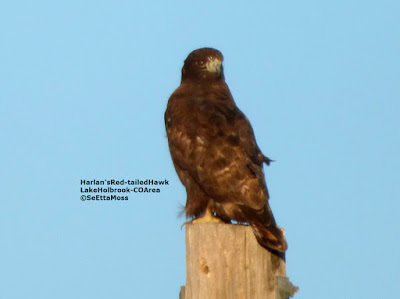 In the past several years I have been delighted to find a number of Harlan's Hawks in south central and southeastern Colorado including my home town of Canon City. 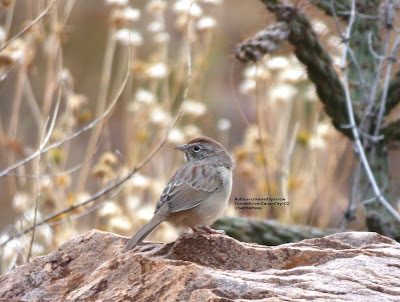 I spotted this first of the season bird as I was walking the Canon City Riverwalk over the week-end. 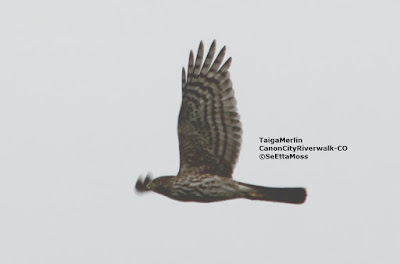 Harlan's are well known to be extremely skittish and the way this hawk flew gave me the impression it was a Harlan's. 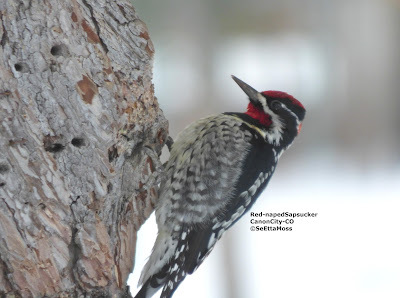 However it ducked into the cottonwoods south of the trail and disappeared. 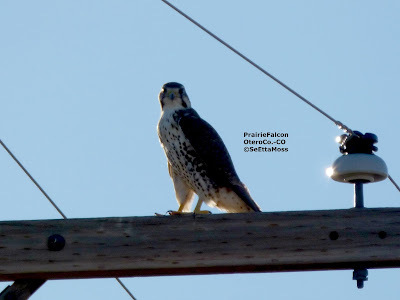 When I returned from my walk I searched for this hawk and found it perched in the cottonwoods about 300-400 feet away--thus my photos are limited by this distance. 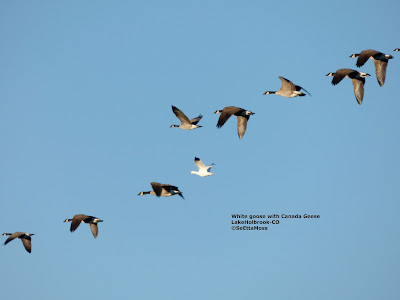 However, the white lores and cheeks, whitish chest, whitish underside of tail with otherwise blackish feathering are clearly seen in the top pic are distinctive for dark/intermediate-morph Harlan's.